Indian weddings have always been known for their grandeur and fun atmosphere , but when it comes to understanding the reason why the bride and groom perform the steps of the ceremony it’s a whole different ball game. 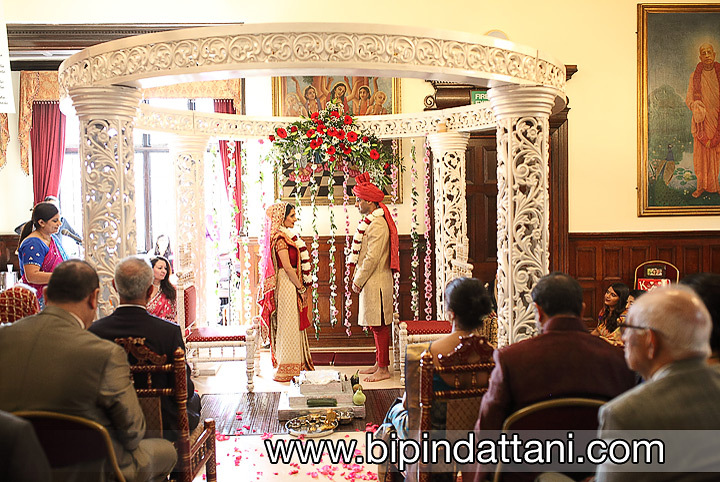 The principle wedding ceremony is conducted as follows at The Hare Krishna Temple ( Bhaktivedanta Manor ), there may be slight variations due to family customs and traditions. The Indian wedding priest’s perceptive will play a small part too . Below I have included images for vedic wedding ceremony from a recent wedding I photographed to make it easier to understand the various parts of the ceremony. 1. 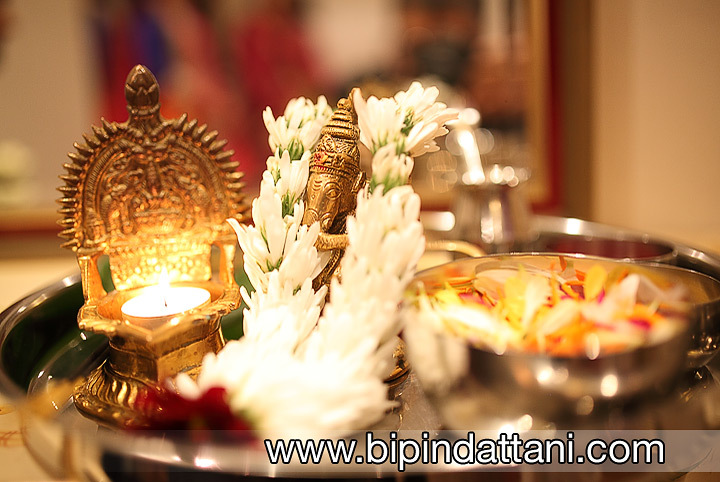 Ganesh Puja – Worship of Lord Ganesh by the bride. 2. Milni – This is to welcome the groom and his family as they arrive. Once the groom has taken his place, the bride, usually accompanied by her maternal uncle, is invited to take her place. 3. Anterapat – A cloth is placed between the couple. The Brahmin (priest) will perform the Sanskrit Mantra and the cloth will then be removed. Traditionally this is the first time the couple will have seen each other. 4. Introduction – This is a brief explanation of the meaning of a Vedic marriage. 7. Kumbha Sthapana – The Brahmin (priest) invites Lord Vishnu to join the ceremony. He then explains the ‘definition’ of the marriage and its commitments as outlined in the Vedic Scriptures. 8. 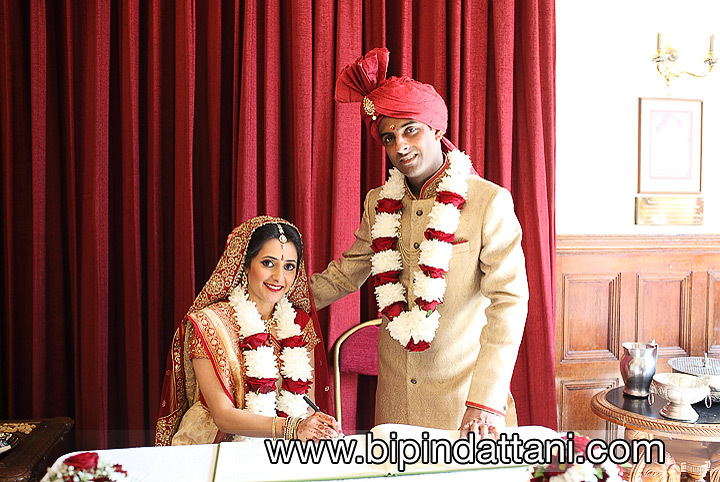 Sankalpa – The Brahmin announces where, when and between whom the marriage is taking place. 10. Kanyadan – This is the most important part of the ceremony. The Bride’s father gives her away to the Groom’s family. This is considered the greatest Dana (gift). The act is confirmed by the exchange of garlands between the bride and groom. 13. Mangal Fera – The fire (Havan) is considered the witness to the whole ceremony. The ceremony here consists of the couple walking around the fire four times, which represents the four aspects of life. 14. Mangal Sutra – Similar to concept of the English Wedding Ring – a golden necklace is presented on a coconut by the Groom’s mother to the Bride. 15. Kum Kum – The Husband puts red coloured Kum Kum on the parting in the hair of the bride. 16. Sapta-Padi – The bridal couple, receive blessings from the priest and everyone present. 17. Darshan – At this stage the curtains in the temple are opened to reveal the beautiful deities of Sri-Sri Radha Gokulananda, Sri-Sri Sita Rama Laxman Hanuman and Sri-Sri Gaura Nitai. 18. Kansar – This is an exchange of Sweets between the couple as a symbolic gesture that they will provide for each other’s needs and prosperity in their household life. 19. Ashirwad – Blessings from the bride and groom’s family that concludes the wedding ceremony. After all the ‘I dos’ it’s dance-floor time and picking a first dance song for your wedding reception is the easiest thing in the world. Only if you and your fiancé have a song you fall in love with. If you’re finding yourself in need of inspiration, look no further than these famous married couples. 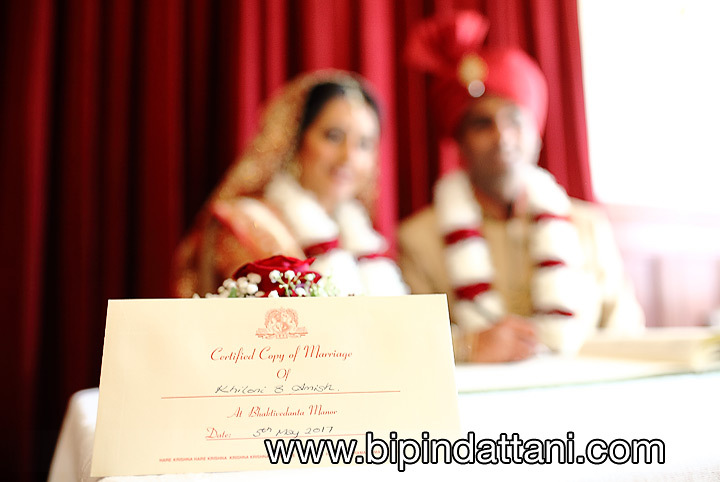 One of the major benefits of booking a Hare Krishna Temple Wedding is that you can have your official Civil or Registry marriage ceremony here too. No more incurring extra costs for organising a separate day. There civil wedding is preformed by the resident temple registrar and not the indian priest conducting the hindu vedic ceremony. Indian wedding celebrations are easily amongst one of the most vibrant, elaborate as well as dynamic on the planet. Unlike in the West, where it is the bride and the bridegroom that are the prominent characters, in an Indian wedding the bride and the groom are the star players however close family relations on both sides are major players too! A Hindu, Sikh wedding is a social affair, and also proclaims the collaborating of not simply the couple however of their families too. It ought to come as no surprise that a majority of the young people abide with their family desires even today and end up having big grand weddings. 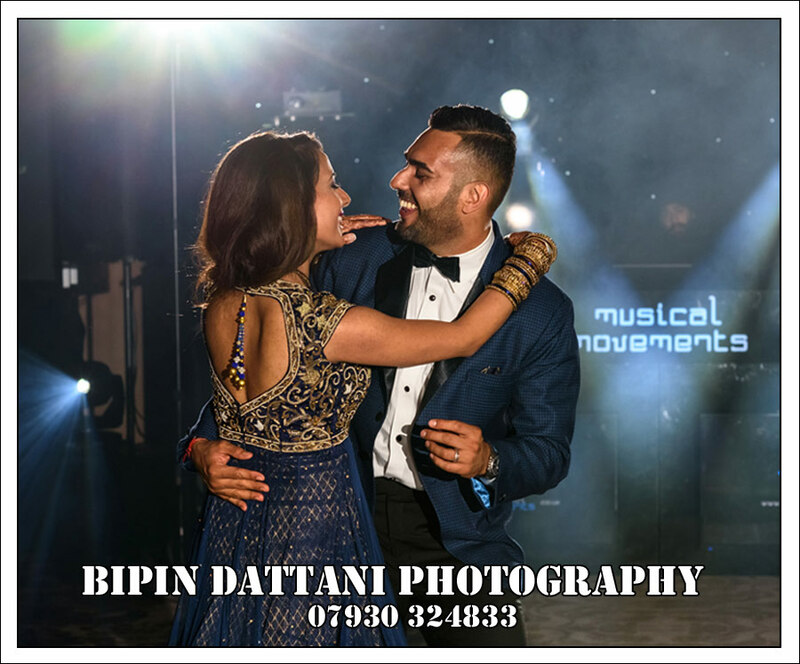 A normal Indian wedding comprises of 3 broad events – the pre-wedding events which are practically as elaborate as the real wedding itself, the actual wedding and for some a post-wedding celebration which generally a wedding reception party. India is a huge and varied country, with the North, South, East and West each having its very own unique languages, customs, cuisine, traditions and wedding rituals. Traditionally a standard North Indian wedding celebration would take place at the new brides’ residence, however now in the current era special wedding venues, forts and grand palaces in Jaipur (the “Pink City”), Rajasthan, New Delhi or a dream beach wedding come true in Goa a luxury hotels such as Goa Marriott Resort & Spa, Grand Hyatt Goa 5-star hotel, Vivanta by Taj‑ Panaji, Leela Goa, Alila Diwa, Zuri White Sands are the norm for well to do families or even for Indian couples looking to get married at special unique wedding venues in typical Indian style with a destination wedding. North Indian nuptials are identified by a number of pre-wedding and post-wedding events. 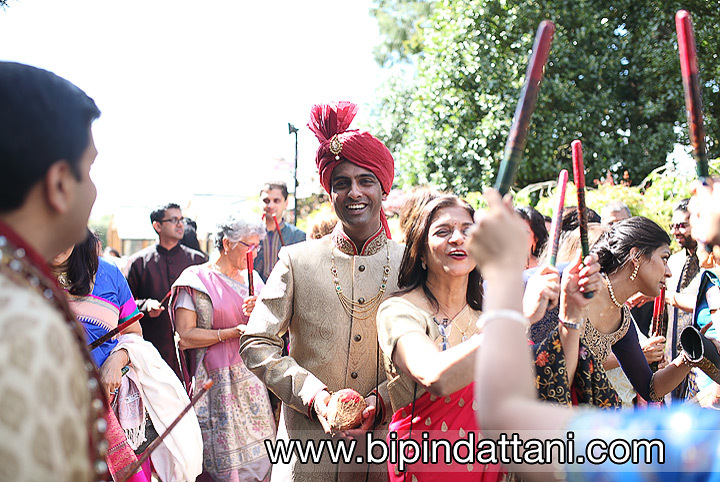 The most important pre-wedding ritual is that of the Mangni or Sagai – the engagement ceremony. The boy and the girl exchange rings in the presence of an Indian priest, both sets of families and many many friends. On the day of the wedding, the groom’s family members sets off for the brides’ residence in the evening with a great deal of cheering, dancing and general good will. A North Indian bridegroom will generally ride a brightly decorated horse, usually with the youngest boy of the family next to him. He is preceded by other family members and friends, wearing their finest wedding dresses and outfits. His face is covered with the ‘sehra’ a curtain of flowers tied by his sister before they leave the house. A music band belting out the songs of the most recent Bollywood chartbusters accompanying the procession all the way to the wedding venue which in the olden times was the bride’s parents house. The groom, his family members and guests are received by the girl’s family, the elders greet each other by exchanging garlands usually made of flowers. The Bride will walk down the aisle with her maternal uncle or uncles (Mama’s) unlike in the West where show will make her grand entrance with her father. One of the 1st ceremony is the bride and groom will exchange garlands in the Jaimala ceremony, one the most crucial of North Indian wedding customs. The following part is the most symbolic one – the Saat Pheras (or the seven steps) that the couple take around the ceremonial fire. This generally occurs really late, typically after midnight, much after the guests have actually indulged and departed, with only the extremely close family on either side are left as witness. Both of them circle the scared fire, making vows to love and honour each other throughout their lives. The bridegroom applies a streak of vermilion (Sindoor) to the bride’s head, after which they end up being lawfully wedded couple according to Indian traditions. A tearful send-off by brides family follows as she leaves to start a new life. 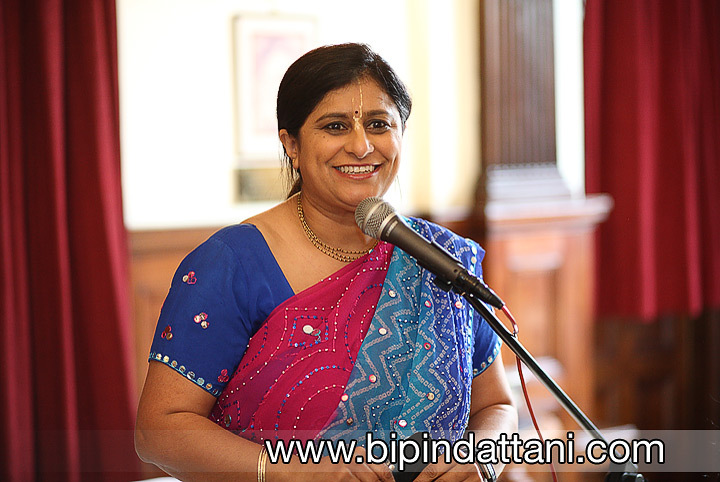 Bipin Dattani, a professional natural Indian Wedding photographer loves capturing these events. South Indian Marriages In Simple Terms. The biggest difference between North Indian and South Indian wedding celebrations is that the latter takes place throughout the day time rather than at night. The basis for the rituals coincide except that they are conducted in a different way. The wedding celebration venue is typically a hall where the wedding mandap (a little covered canopy structure) has actually banana trees tied to both the posts, overhead festoons constructed from mango leaves strung together, and Rangoli made with coloured powder decorate at the entryway. The evening prior the wedding day, the groom is led in a floral decked procession from a temple by the bride’s mum and dad to the wedding venue (Mandapam Hall). Once there, the formal espousal ceremony occurs. The elephant-headed god Ganapati, the God of Initiation, is invoked, and is entreated to to keep away all obstacles away from the pair getting married. The custom of presenting new clothes to the pair is then performed. 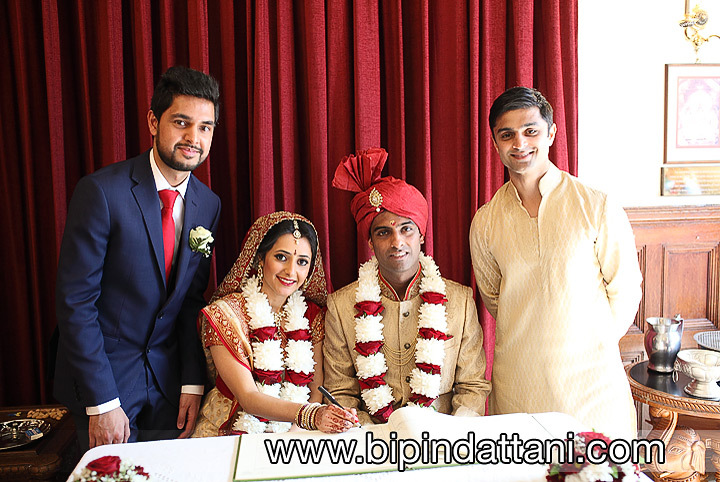 The actual marriage is performed by a Vedic priest who chants ancient hymns and verses, recalling the names of 3 generations of ancestors of both, the bride and the groom in format of all gathered guest at the wedding. The bride and groom exchange garlands when they are raised onto the shoulders of their respective uncles. The bride then sits on her father’s lap for the ‘Kanyadan’ (distributing the daughter) event to the bridegroom. The bride-to-be is provided with a Mangalsutra (the scared neckless that signifies she is now a married lady) in addition to a new sari which is draped around her by the groom’s sister. Hereafter, the bridegroom walks 7 steps with his bride, holding her hand in his. The 7 steps are the most vital part of the wedding event ceremony. The wedding celebration is followed by a sophisticated and savoury wedding banquet, normally vegetarian. All in all this is a great special occasion for any indian wedding photographer to photograph.